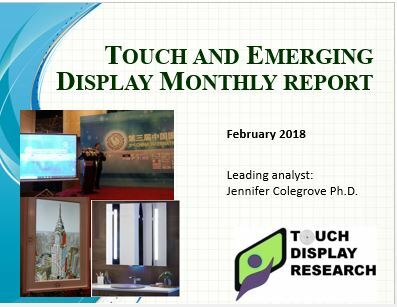 February Report: OLED, QLED, Voice and Smart Mirrors - Touch Display Research, Inc.
Santa Clara, California, February 8, 2018—In the recently published “Touch and Emerging Display Monthly Report,” Touch Display Research Inc., a market research and consulting firm, analyzed the technology hot trends: OLED, QLED, gesture control, ITO-replacement, ePaper display, voice command and smart mirrors. “I just returned from the China International Quantum Dots Summit at Shanghai. It was my honor to meet some of you in person. A brief review is included in this report. Quantum dot displays and OLED displays will co-exist, each has its advantages and suitable applications. Samsung will develop a foldable smart phone/tablet hybrid device in 2018. Apple HomePod will join 40 other smart speakers in February 9th, 2018. Voice recognition and smart speaker market forecast is provided in this report,” said Dr. Jennifer Colegrove, CEO and Principal Analyst of Touch Display Research Inc., who has authored reports on the touch panel and emerging display industry for over ten years. The February 2018 report is available immediately.